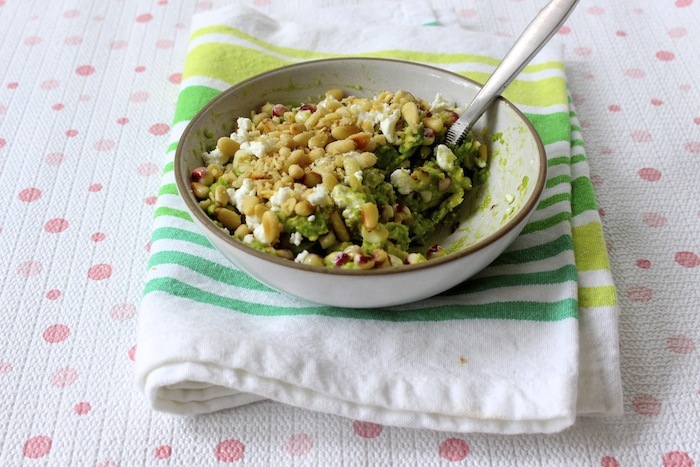 Let me begin by saying that I never thought I’d write this post — one that features goat cheese. Real goat cheese and not some sort of cauliflower/nut/faux-cheese concoction. 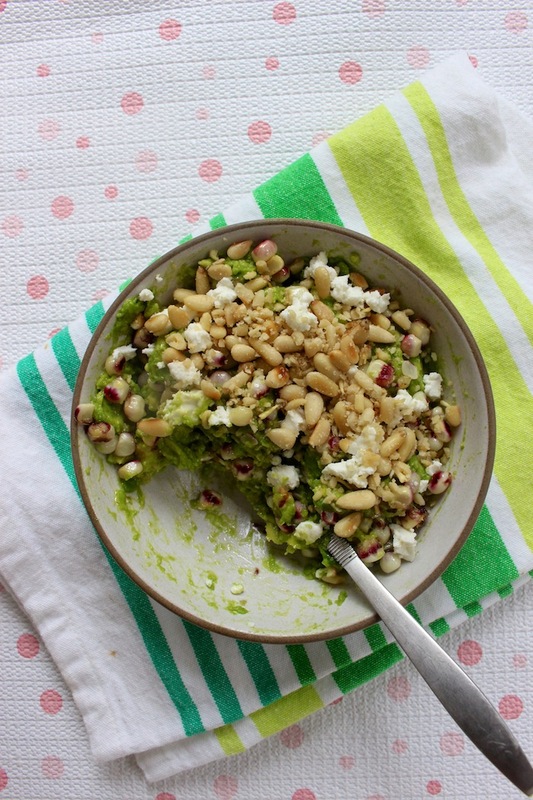 Along those same lines, I never thought I’d be putting said goat cheese (or any cheese, for that matter) on top of guacamole — an already rich and creamy delight. Because for a long time, real cheese has been on my low-so, do-not-eat lis. But low and behold, it has happened. I’ve eaten goat cheese. And I’m so glad it did. So back to the goat cheese. How did this ingredient land on my low-so table and my guacamole? For years, I’ve stayed away from most cheeses, save the occasional slice of low-so swiss, mascarpone, Paneer, and online-purchased “cheddar” — which apparently has been discontinued. But as I always advise, never stop looking for new food products at the store. Even when you think ingredients are totally beyond your low-sodium possibilities, keep turning those cans and packages around, and take a gander at the labels. You never know what you may find. And a few weeks ago, while shopping and cooking for my column on theKitchn, I decided to try making something crazy: nutty guacamole. And then I did something even crazier: I decided to put goat cheese on it. I figured other non-low-so eaters would enjoy this savory addition, even if I couldn’t eat it. But that, my friends, is when it all happened. I grabbed that roll of goat cheese, flipped it over, and saw something I never expected; a mere 40mg of sodium per ounce. Now, I have not eaten goat cheese, well, ever. Because by the time I had the maturity to appreciate its flavor and not just ask for those plastic wrapped slices of cheddar, I was already on a very low-sodium diet. One which I thought excluded goat cheese. But once I actually looked and found this product and whisked it home, I dipped my finger into the good stuff and nervously took a lick. And wow, does it have tang. Glorious tang that pops on your tongue. And is so bright that you only need a very little bit to provide a huge flavor boost. And I’m taking little. As you’ll see in the picture, I only used a small sprinkle of goat cheese, probably not even an ounce. But holy guacamole, could you taste the difference. It added just enough of a savory and, yes, salty, kick to completely change the profile of the dip. Add in those toasted, creamy pine nuts and you may never eat smashed avocados the same way again. I know I won’t. So what’s the point of this goat cheese post? Well first of all, it is always important to consult your doctor and dietitian or nutritionist to understand your particular food needs. As well as how much sodium (and other nutrients) you should limit and/or consume. 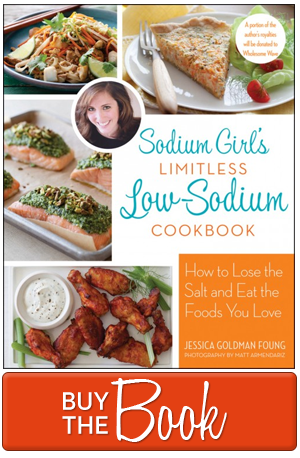 They are the professionals (I am just a motivational eater) and they will help you best plan and navigate a low-sodium diet that works for you and your health. Because everyone reading this blog has different sodium and nutritional needs. But, what I’ve been reminded through this goat cheese experience is that products are constantly changing. It’s important to constantly read labels and look in places that you think are off limits. Sometimes you’ll be surprised with what’s there. 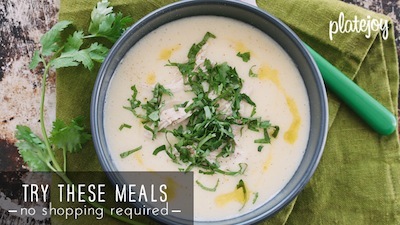 And, if you understand the sodium content of those products and take them into account with the rest of your diet and daily sodium consumption, a little sprinkle of goat cheese (or even Parmesan or whatever else you may find) may add just enough of a salty kick to please your palate without tilting the sodium scales. Especialy for those just begin a low-so diet and slowly adjusting their tastebuds. So whether you leave the goat cheese for your non-low-so guests or treat yourself to a sprinkle, remember to keep checking on what the cheese aisle has to offer you. Trader Joe’s Ciliegine (mini mozzarella balls) only have 25 mg of sodium in 3 pieces! And they are super delicious. I am taking a medication that contains a huge amount of sodium, so I’m stuck on a very bland diet to prevent hypertension. I was very excited to find your blog and book via the Food Network just now. I must read more!